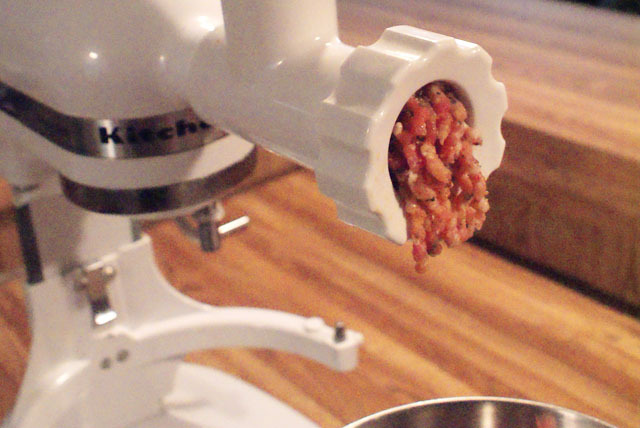 Making sausage at home is so much easier than you think. Don't worry if you don't have a meat grinder! I lucked out and got a Kitchen Aid stand mixer with a meat grinder attachment as a wedding gift (lucky me, right? ), but you can always buy the meat pre-ground at the store and use it for this recipe. Just don't buy it seasoned yet. That's what's special about this recipe...all the beautiful spices! And the lack of chemicals. It's one of those times when it's pretty cool to know exactly what's going into your food. If you make the small investment on the spices that you might not already have in your pantry, you can make superior Italian Sausage that's way healthier, way tastier, and for way less money that pre-made stuff. And if you don't have a meat grinder, I highly recommend getting one. I always feel kind of primal and oddly fulfilled when I'm standing in my kitchen pretending I'm a butcher and grinding my own meat. Fun stuff! 1. 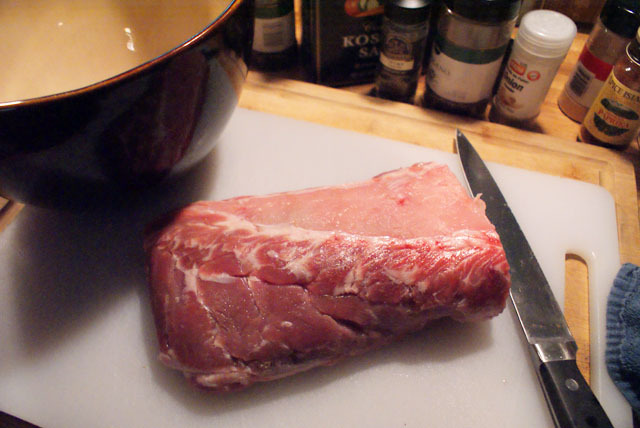 Cut the pork into 1½ inch cubes and place the pieces into a large bowl. 3. 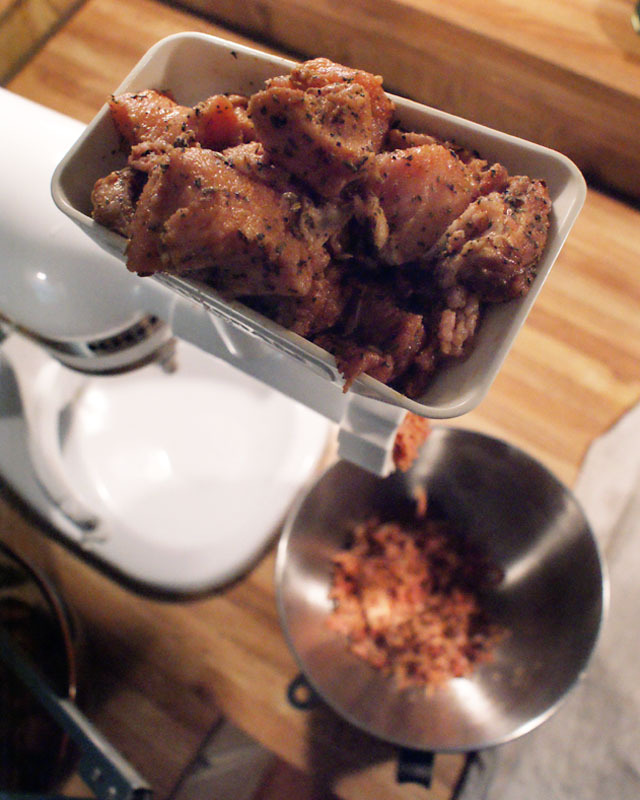 Run the meat through your meat grinder using the coarse grind plate. 4. Done! 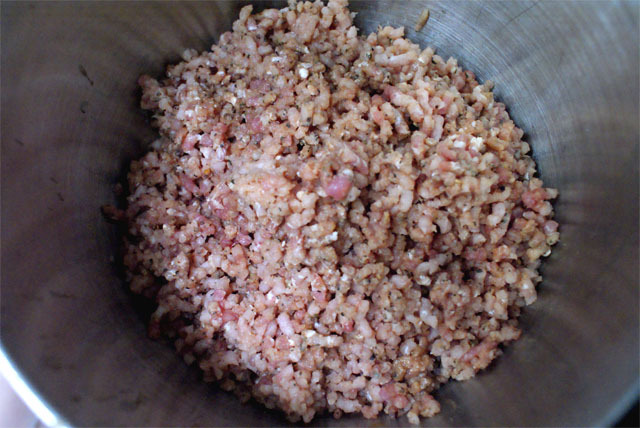 If desired, you can process into casings for link sausage, but I like to leave it in the form of bulk sausage to use for making sausage patties, adding to meatballs or spaghetti sauce or in soups. 5. I process mine in to small packages to freeze for later use. 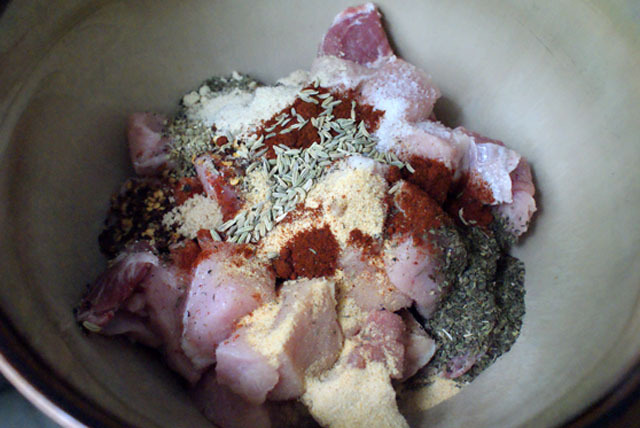 If you're using meat that is pre-ground, put all of the ingredients into a large bowl and use your hands to mix everything together until the spices are evenly distributed. Don't forget to enter my Cooking Planit T-fal Giveaway while you're here for a gorgeous set of T-fal Cookware! Click the image below to go to the Contest Page! Can I use this for pizza? I am a big fan of sausage but I have never tried do it because I don't know how to make meat into meatballs .that is so simple,stupid. thank for sharing!!!! I like Italian food. But I never try this recipe. thanks for the guide, should be useful whenever I can afford/have the space for a meat grinder. Do you have a problem with the grinder clogging? I have also used the coarse grind plate.I am a little frustrated. I am sorry you had trouble! I did not have problems with my grinder clogging. 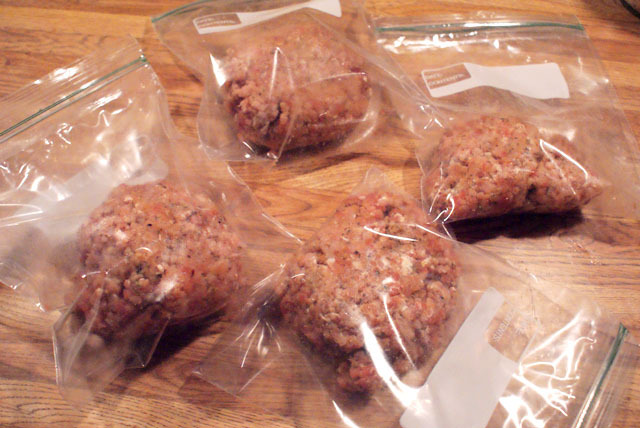 If you freeze your meat half way before you grind it will help with your clogging issue. Do you happen to have a recipe for sweet Italian sausage? We like ours just a little less spicy, with some added sweetness. Thanks. I sure don't, but I think increasing the sugar and reducing the crushed red pepper would work. This is our go-to recipe when we make sausage. We have made it at least half a dozen times. We love it!! Thank you so much for the great recipe and the clear instructions.